Haryana’s khap panchayats have earned notoriety by ordering “honour killings” or asking married couples to separate. Given their social influence, they can do a lot of good work too like settling local disputes, saving unborn daughters and conserving life-saving water resources. The Indian diaspora has been a tremendous resource not only for the countries in which these people of Indian origin have settled, but also for the nation from which they originate. Indian soldiers of yore visited far-off lands and came back with ideas that increased the craving for freedom from the colonial yoke. The manner in which our languages are losing their cultural contexts and gibberish (kolaveri di) is replacing literary merit of poetry, at least in terms of popularity, it may seem that Sanskrit and sanskriti (culture) are both obsolete, quaint and out of context. HOW different the dynamics of people’s politics is from the dynamics of electoral politics was clear by the turn the Bill to constitute the institution of Lokpal (Ombudsman) to deal with corruption took in Parliament. A man that is young in years may be old in hours…!” Sir Francis Bacon said this in one of his essays. He probably meant that even a lasting remark isn’t the lasting remark for all times to come! In my own life-time-May I live long enough to mark more changes-I have seen assaying essays, a tad differently, being enough updated and modern. Not different in shape but in style sans grammar and contours. Every year the lives of almost 1.4 million people are cut short as a result of a road traffic crash in the world. 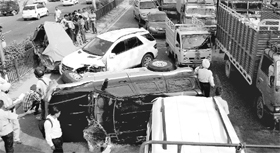 More than 1.6 lakh people die in India due to RTAs( road traffic accidents). Between 20 and 50 million more people suffer non-fatal injuries, with many incurring a disability as a result of their injury. Haryana’s khap panchayats have earned notoriety by ordering “honour killings” or asking married couples to separate. Given their social influence, they can do a lot of good work too like settling local disputes, saving unborn daughters and conserving life-saving water resources. A khap panchayat in the Jhajjar area has asked farmers in 36 villages under it to stop paddy cultivation. Though it has no legal sanction to impose a fine and a social boycott too is an extreme step, the panchayat should educate the growers insisting on paddy cultivation about the damage the crop is doing to the falling water table. Since the groundwater level in Haryana and Punjab has declined to alarming levels, a water-guzzling crop like paddy is no longer viable. Experts have for long advised farmers in this region to shun paddy. In August last year the Central Ground Water Board suggested to the governments in Punjab and Haryana that at least one district in each state should grow crops other than paddy. Nothing has happened. The post-harvest burning of paddy straw, which causes air pollution, continues despite being outlawed. Efforts to encourage farmers to adopt sprinklers and drip irrigation have had limited success despite a 75 per cent subsidy on them. The Centre is trying to promote alternative crops which need minimum water like pulses and oilseeds by offering higher support prices and assured procurement, but to no avail. The chief reason given for farmers opting for paddy is the returns are higher than from any other crop. This may not be true if the input costs of free electricity, the subsidy on diesel and the installation of submersible pumps, and the long-term damage to groundwater resources are taken into account. In fact, Punjab and Haryana pay a heavy price for growing paddy. It is, therefore, important to rope in panchayats to spread awareness about the environmentally destructive role paddy cultivation plays in this region with limited water resources. They can help in reviving village ponds and making rainwater harvesting popular. Collective efforts are needed to save the life-line called water. The Indian diaspora has been a tremendous resource not only for the countries in which these people of Indian origin have settled, but also for the nation from which they originate. Indian soldiers of yore visited far-off lands and came back with ideas that increased the craving for freedom from the colonial yoke. Indians in South Africa paved the way for Mahatama Gandhi, the political activist. Indians in the UK and the USA kept the freedom movement alive with ideological and physical inputs, and the list goes on and on. Their motherland honours them both institutionally and as individuals. Come winter, there are a number of functions that celebrate the diaspora and its achievements, like the Pravasi Bhartiya Divas, which is in its 10th year now. Of late, the government has been proactive in dealing with the problems of Indians abroad, be it in Libya, from where 16,000 nationals were evacuated or other trouble spots like Egypt and Yemen. Even in cases where Indian nationals run afoul of the law of the land, government intervention has provided them with some succour. On their part, remittances from the Indian diaspora have helped the local economy in some states which have a high number of emigrant families. However, when it comes to investing in the Indian economy, the NRI has not contributed as much as would be expected. This especially contrasts with the attitude of the Chinese immigrants, who have made substantial investments in their motherland. Among the major reasons cited by potential investors are the lack of transparency in decision making, corruption, and break in continuity when a government changes, especially at the state level. While these are valid concerns, the NRIs, too, need to make proactive efforts to contribute more to the Indian economy in a meaningful way by investing in the growth of Indian industry. Only then would they have, as the Americans say somewhat inelegantly, put their money where their mouth is. The manner in which our languages are losing their cultural contexts and gibberish (kolaveri di) is replacing literary merit of poetry, at least in terms of popularity, it may seem that Sanskrit and sanskriti (culture) are both obsolete, quaint and out of context. But, since the rest of the world has begun to chant the Vedic hymns and is looking up to Sanskrit to offer panacea for global issues, we are forced to take note of it, despite our fixation with everything English. Considering that we have a tendency to politicise and communalise our languages — we did it to Urdu and killed a language system of great finesse — some efforts were made to communalise Sanskrit too by some militant secularists who filed a petition against the teaching of Sanskrit in the Central Board of Secondary Education (CBSE) on grounds that it was against secularism. The apex court refuted the absurd proposition in 1994 to save the language from its further communalisation. Yet, merely introducing a language, as rich as Sanskrit, at school level in a three language formula is not enough to explore its linguistic richness. Nor is it enough to run degree courses in the universities, because of the ‘scoring’ advantage of the subject. Compared to the gains reaped by Germany and the USA, by their research and scholarly studies conducted on the vast reservoir available in Sanskrit, in India we are still stuck at our Akashvani broadcast in Sanskrit, which is highly Hindi-ised, according to foreign scholars of Sanskrit. The advantage of this reservoir of knowledge — may it be Panini’s treatise, Sanskrit dramas, Vedas, Vedangas, epics, kavya ( poetry), science, philosophy, aesthetics, medicine, Kautilya’s Arthashastra — the treasury is lost to us in the absence of serious conviction and research. The timeless wisdom contained in the language needs more than rhetoric and symbolic seminars. It needs to attract the best talent available in linguistics to help it enrich other streams of knowledge by its reservoir. Despite leaders like B R Ambedkar and Pt Jawaharlal Nehru, who supported the cause of Sanskrit, it is due to our colonial mindset that the language still gets identified with pundits and Hindu rituals. While our Sanskrit scholars deliver speeches in English, the foreign scholars of Sanskrit compose songs in this heritage language, thereby lending it a modern appeal. HOW different the dynamics of people’s politics is from the dynamics of electoral politics was clear by the turn the Bill to constitute the institution of Lokpal (Ombudsman) to deal with corruption took in Parliament. The first, dependent on the popular support, got nowhere. But the second, dictated by the number game, succeeded because the political parties could interpret the status quo, the non-passage of the Lokpal Bill, in the way it suited them electorally. When Gandhian Anna Hazare was on fast and thousands were on the streets, the Lok Sabha passed the sense of the House resolution to promise an Act to cover the three points: A citizen’s charter, including his right to have water and electricity; the lower bureaucracy under the Lokpal; and establishment of Lokayuktas in the states. The Bill has conceded only one point — the appointment of State Ombudsman (Lokayukta). And the government continues to retain the control of the Central Bureau of Investigation (CBI). When the resolution was adopted, the dynamics of people’s politics worked. Subsequently, the same House accepted a watered-down Bill because Anna was not on fast and the people were only watching the outcome of the debate in Parliament. There was no pressure on the government. Still something worse happened in the Rajya Sabha because the Bill, emerging from the Lok Sabha, was not even put to vote. True, the House had consumed the day, till midnight, in speeches alone. But the manner in which the chairman, Vice-President Hamid Ansari, adjourned the House sine die leaves many questions unanswered. The government could have extended the session but did not. Obviously, it was influenced by Anna Hazare breaking his fast one day earlier than the period he had announced and the venue, shifted to Mumbai from Delhi, did not draw an impressive crowd. Too many adjournments interrupted the House proceedings — Laloo Yadav, the joker in the pack, was handy — he lessened the time for the debate. Whatever the government’s compulsions, it was a betrayal of the Lok Sabha resolution. That was because the dynamics of electoral politics took over when the Bill was not going through in the Rajya Sabha, each party calculating how many seats it would get in Punjab, UP, Uttarakhand, Goa and Manipur. There is a lesson for those who have put their faith in people’s politics. I do not want to indulge in the I-told-you-so argument. Yet I recall the warning I gave on suspending the agitation. My fear, justified now, was that the momentum of demonstrations would be difficult to rebuild once stalled. Today the impression that has gone around is that those leading the movement are whimsical, switching it off and on too often. Now that the strategy is being reworked, it would be counter-productive to clutter people’s mind with too many details on the weaknesses of the Bill. Let the movement concentrate on one point: Independence of the CBI. The agency cannot be under the government which uses it as a political instrument. Cases have been followed, dropped or kept in abeyance, depending on the support the government needed from a political party at a particular point of time. The Manmohan Singh coalition is not alone to blame. It was the same story when Atal Bihari Vajpayee of the BJP was the Prime Minister or Narasimha Rao held the position. The weakening of the movement has once again thrown up the same old question: Should people’s movements continue to stay away from participating in elections? So far they have kept themselves out. Some argue that the gamut of polls is so much ridden by money and caste that the people’s movements would have to make compromises if they propose to contest. Yet in a democratic polity, there is no running away from elections. The state assemblies and Parliament are manned by the representatives of people who choose them through the ballot box. Representatives are the arbiters. Should the pressure on them be from outside with uncertain or limited results or should “we the people”, as the Constitution’s Preamble says, give the country an alternative which would be from the grassroots. Both the Congress and the BJP, the two main parties for the last three decades, have failed the people. Their agenda is power which, for them, is the end by itself. Gandhian Jayaprakash Narayan, who successfully ousted the Indira Gandhi government, constituted the Janata Party which won a majority in the Lok Sabha. He too had first confined himself to the agitation alone. He met Prime Minister Indira Gandhi to beseech her to deal with corruption and the use of large sums of money in elections. She said her party had no money and that it was fighting against corruption ruthlessly. The Congress has taken more or less the same line today. The only difference is that the Manmohan Singh government has brought to Parliament an apology of Bill to show that it was committed to dealing with corruption and got it through the Lok Sabha. Anna and his team can tear a leaf from the book of the communists. They had to take the way of electoral politics even when their ideology dictated them to revolt against the bourgeois system which was based on the principle of elections. In fact, they are caught in a comical situation: They preach communism which believes in dictatorship but participate in elections which follow the dictates of democracy, an anti-thesis of dictatorship. This is the reason why their influence is limited. It will remain so until they shed their doctrinaire approach. To expand their base, the Left has to adopt a democratic, liberal stand that attracts civil society. The Left enjoyed that position till Partition and lost its way after that. Mahatama Gandhi fought against the British through the electoral system, however weak and limited. And he had to have the Congress party as an instrument to push the freedom struggle. He was not the party’s member because he wanted to build it in a manner so that each member, he or she, would rise above personal gain for the good of society. He failed but won Independence. Anna may not be a Mahatma Gandhi or a Jayaprakash Narayan. But Anna has come to represent people’s resentment against corruption and all that they suffer in their daily life. He does not have to go after one party. He transcends parties and parochial politics. He is pursuing an ideal which should remain unsullied because that is an ideal. All NGOs should help his movement, however impossible owing to some of his team members. A failure of people’s movement is the failure of the principle of peaceful protest against mis-governance or non-governance. The nation cannot afford to lose. Some of the standard essays, short stories, letters and composition paragraphs that I was asked to write in my formative years, to the analogue of primary and middle standards, were, no doubt, the stereotypes, but today I can take a sizzling stab at them. Afresh. Spicy and juicy. Here we go! MY BEST FRIEND: My best friends are mostly on the social networking sites. These virtual friends are better than my real ones. The latter demand a lot from me and are generally the ones who are always in need. I don’t have only one best friend. I have many best friends on Facebook, Twitter, Orkut, Linkedin, Google Plus, etc. A HOUSE ON FIRE: Every house seems to be on fire. There is enough domestic violence seen. Siblings vie with each other to grab parental properties. Parents’ stress levels keep rising every now and then at the doings of their progeny. Youngsters prefer living in a live-in arrangement, away from their parents. Old parents are left to fend for themselves in the twilight years of their life for want of children’s care. A CRICKET MATCH: Let me begin with match-fixing. Then come the scantly attired cheer leaders who are the dominant part of modern cricket without whom you cannot enjoy a shot, a hit, a catch, a boundary, a sixer or a hat-trick. The 20-twenty genre is the cricket tablet of today which gives you a kick 10 times more than what you got out of a one-day one. Cricket also ensures a career in journalism when you are out and out of the field. AEROPLANE JOURNEY: Well, it used to excite once upon a time. Nowadays you sit in a traumatised state with your legs developing thrombosis and your neck becoming that of a crane in that strait-jacketed economy class which doesn’t come as cheap. If someone referred to it as cattle-class it wasn’t an upfront against the bovines but brainy tweeters. It is while undertaking such journeys that one’s diplomatic or statesmanlike status is frisked for confirmation or otherwise of a nuclear programme or a biological terrorist plan. THE POSTMAN: He’s long dead. His look-alike is the courier-wala. He doesn’t wear a khaki uniform. In fact, he doesn’t wear any uniform. He has a pair of Reebok to boot for he has to hop-stop-or-jump-the-gate, delivering insured packets ‘right in the hands of the addressee or the right addressee’. Like the postman, he doesn’t bring good or bad news (people already know it by more quicker means via the internet or satellite); he rather brings documents about which the sender and the receiver already have a business to know-he just couriers them. MY COW: My cow is among the holiest cows around. It has five legs-one extra from Jersey that helps her kowtow the exotic tag. She’s imported only to be kept in the herd for other cows to keep feeling cowed down and deliver milk without an Oxitocin prick-no pun intended, please! My cow is secular to the desirable levels and doesn’t crib at beef-eater drunkards for she knows how to behave in a cosmopolitan environment. OUR PRIME MINISTER: They are so many. The prime turban is worn by one. The rest are after it. One is behind them all. Another one is above him with a sun-shine. He is the calculator. But his economy in matters murky is exploited by his men. But they are all honourable men. So is our Prime Minister. Road traffic injuries cause a considerable economic loss to victims, their families and to the nation as a whole. These losses arise from the cost of treatment, including rehabilitation and incident investigation, as well as reduced/lost productivity (e.g. in wages) for those killed or disabled by their injuries, and for family members who need to take time off work (or school) to care for the injured. There are few global estimates of the costs of injury, but an estimate carried out in 2000 suggested that the economic cost of road traffic crashes was approximately US$ 518 billion. National estimates have illustrated that road traffic crashes cost countries 1-3% of their gross national product, while the financial impact on individual families has been shown to result in increased financial borrowings, and even a decline in food consumption. In India, according to a rough estimate, we lose more than Rs 1,60,000 crore every year. Road traffic injuries have not been included in the global health agenda for many years despite being predictable and largely preventable. Evidence from many countries shows that dramatic successes in preventing road traffic crashes can be achieved through concerted efforts that involve, but are not limited to, the health sector. But is it on agenda on our government in India, or for that matter Punjab? No it is not. More than 90% of the deaths that result from road traffic injuries occur in low- and middle-income countries. Road traffic injury death rates are the highest in the low- and middle-income countries of the African and Middle Eastern regions. Even within high-income countries people from a lower socio-economic background are more likely to be involved in a road traffic crash than their more affluent counterparts. Children and young people under the age of 25 years account for over 30% of those killed and injured in road traffic crashes. Road traffic fatality rates are higher in younger age groups. From a young age, males are more likely to be involved in road traffic crashes than females. Among young drivers, young males under the age of 25 years are almost three times as likely to be killed in a car crash as young females. Road traffic injuries are preventable and can be prevented. Governments need to take action to address road safety and accident prevention in a holistic manner that requires the involvement of multiple sectors (transport, police, health, education, NGOs) and that addresses the safety of roads, vehicles and road users themselves. Effective interventions include designing safer infrastructure and incorporating road safety features into land-use and transport planning; improving safety features of vehicles; and improving emergency medical services and post-crash care for victims of road crashes. Interventions that target road user behaviour are equally important such as setting and enforcing laws relating to key risk factors, and raising public awareness about these. Here are some key risk factors. An increase in the average speed is directly related both to the likelihood of a crash occurring and to the severity of the consequences of the crash. Some other facts are below. n Pedestrians have a 90% chance of surviving a car crash at 30 km/h or below, but less than a 50% chance of surviving the impact of 45 km/h or above. n 30 km/h speed zones can reduce the risk of a crash and are recommended in areas where vulnerable road users are common (e.g. residential areas, around schools). n Apart from reducing road traffic injuries, lower average traffic speeds can have other positive effects on health outcomes (e.g. by reducing respiratory problems associated with car emissions). Drinking and driving increases both the risk of a crash and the likelihood that death or serious injury will result. n The risk of being involved in a crash increases significantly above a blood alcohol concentration (BAC) of 0.05 mcg (micro gram). n Laws that establish BACs of 0.05 mcg or below are effective at reducing the number of alcohol-related crashes. n Enforcing sobriety check-points and random breath testing can lead to a reduction in alcohol-related crashes by about 20% and have shown to be very cost-effective. n Wearing a helmet on a scooter/motorcycle correctly can reduce the risk of death by almost 40% and the risk of severe injury by over 70%. n When scooter/motorcycle helmet laws are enforced effectively, helmet wearing rates can increase to over 90%. n Requiring helmets to meet recognised safety standards is important to ensure that helmets can effectively reduce the impact of a collision to the head in the event of a crash. n Wearing a seat-belt reduces the risk of a fatality among front-seat passengers by 40-50% and of rear-seat passengers by between 25-75%. n Mandatory seat-belt laws and their enforcement have been shown to be very effective at increasing seat-belt wearing rates. n If correctly installed and used, child restraints reduce deaths among infants by approximately 70% and deaths among children between 54% and 80%. There are many types of distractions that can lead to impaired driving, but lately there has been a marked increase around the world in the use of mobile phones by drivers that is becoming a growing concern for road safety. The distraction caused by mobile phones can impair driving performance in a number of ways, e.g. longer reaction times (notably braking reaction time, but also reaction to traffic signals), impaired ability to keep in the correct lane and shorter following distances. n Text messaging also results in considerably reduced driving performance with young drivers at particular risk of the effects of distraction resulting from this use. n Drivers using a mobile phone are approximately four times more likely to be involved in a crash than when a driver does not use a phone. Hands-free phones are not much safer than hand-held phone sets. n While there is little concrete evidence yet on how to reduce mobile phone use while driving, governments need to be proactive. Actions that can be taken include adopting legislative measures, launching public awareness campaigns and regularly collecting data on distracted driving to better understand the nature of this problem. n About 1.4 million people die each year as a result of road traffic crashes. n Road traffic injuries are a leading cause of death among young people, aged 15-29 years. n Over 90% of the world's fatalities on the roads occur in low-income and middle-income countries, even though these countries have less than half of the world's vehicles. n Nearly half (46%) of those dying on the world's roads are "vulnerable road users": pedestrians, cyclists and motorcyclists. n Without action, road traffic crashes are predicted to result in the deaths of around 2 million people annually by 2020.
n Only 15% of countries have comprehensive laws relating to five key risk factors: speeding, drinking and driving, and the use of motorcycle helmets, seat-belts and child restraints. n Create safe road infrastructure by implementing all aspects of road safety. n Create and amend laws on road safety like changing from 304A, IPC, to a stricter law so as to create the fear of law among offenders. n Start teaching road safety from nursery classes like moral science to create more responsible citizens for road safety. n Create a wing like NSS for road safety such as RSS (Road Safety Service) in schools and colleges. n Have a separate Road Safety Police / Traffic Police Wing, fix their responsibility and accountability for road safety. n Strictly enforce all the road safety rules so that the public should fear breaking them. n Ask manufacturers to produce safer vehicles and consider including Alco locks & mobile jammers while driving . n Strictly implement laws related to speed governors in goods vehicles/school buses etc. n Restrict access to highways. n Promote/publicise road safety more aggressively.